The original recipe can be found here. I changed the outside coating to be chocolate. These could be changed up for any holiday by simple changing the sprinkles. In a large bowl, whisk the cake mix, flour and the sugar. Next stir in the melted butter, vanilla, milk and the sprinkles. The mixture should be moist and be able to hold its shape easily when formed. Use a cookie scoop to form the mixture into even balls and refrigerate for 20-30 minutes. While the truffles are in the fridge, melt the chocolate in a double boiler or slowly in the microwave. 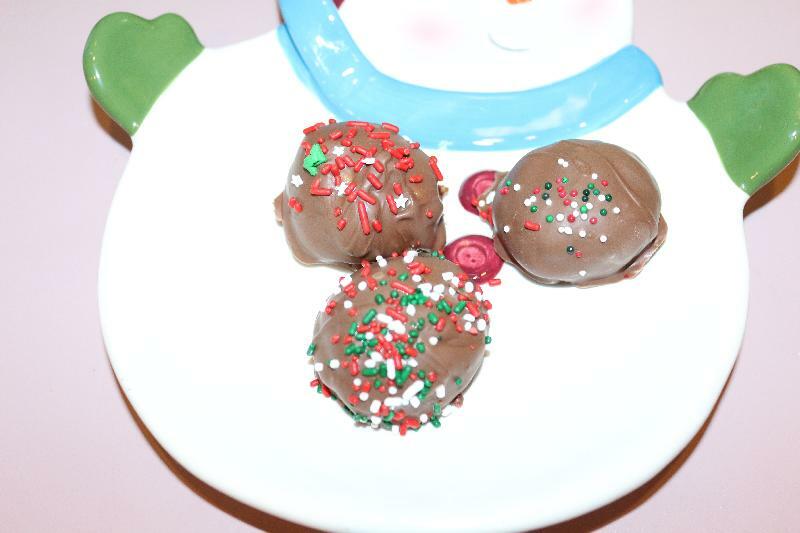 Use a fork to drop one of the cake batter truffles into the chocolate and roll around to coat. Tap off the excess chocolate and gently transfer to cookie sheet lined with wax paper. Put more sprinkles on top of each cake ball.